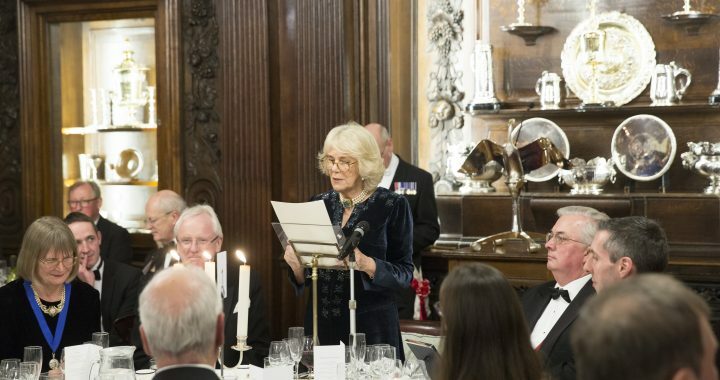 London, 31 January 2019: HRH The Duchess of Cornwall attended a dinner this evening organised by Wines of Great Britain (WineGB), the UK wine industry’s national body, to celebrate one of Britain’s success stories. Hosted by the Worshipful Company of Vintners the dinner took place in Vintners’ Hall, the spiritual home of the wine trade. Guests were treated to a wide range of award-winning wines from around the UK during the evening. Her Royal Highness is President of Wines of Great Britain and also a Liveryman of the Vintners’ Company. Her connection to wine is through her father, Major Bruce Shand, who was a wine merchant and The Duchess herself grew up in Sussex, now one of the main wine-growing regions of England. “Our industry is going through seismic change,” commented WineGB’s Chairman, Simon Robinson, in his speech to dinner guests who included representatives of English and Welsh national and local government, major suppliers to the industry, journalists and a number of the country’s leading winemakers and industry leaders. Acknowledging 2018 as a milestone year for the industry, Simon Robinson detailed the considerable pace of growth taking place and what WineGB is undertaking to ensure its long-term development. 2018 was a vintage year for both quality and quantity for English and Welsh wines, with a record-breaking 15.6 million bottles produced. Higher volumes are predicted in the years to come due to ongoing expansion of vineyards across the country, as acreage planted has grown 160% in the last ten years. Last year alone 1.6m vines were planted – over 1000 acres (405 hectares) – and vine plantings may exceed the 2m mark in 2019, confirming the UK wine industry as one of the fastest-growing agricultural sectors in the UK. UK’s place on the global wine stage was also consolidated last year with more major awards in key wine competitions and with some notable firsts: the Sommelier Wine Awards saw the UK awarded more medals than Champagne; the accolade of International Sparkling Winemaker of the Year Award in the International Wine Challenge was awarded to Cherie Spriggs from Nyetimber – a first time win from outside Champagne (and the first female winner); and the first time an English wine producer won ‘International Winemaker of the Year’ in the International Wine & Spirit Competition awarded to Ridgeview Wine Estate. Sales of GB wines continue to grow both here and overseas and based on current trends are projected to increase to some 40m bottles per annum by 2040. Almost every UK multiple retailer now stocks English and Welsh wines and domestic sales through retailers and restaurants are set to grow, as are sales direct from vineyards and online. Forging the next generation in the industry: Education and training is the key to fostering the vineyard managers, winemakers and marketers to fulfil the demands of an ever-expanding industry. WineGB estimates an increase from the current 2,000 employed to approximately 24,000 by 2040. The industry is not only offering great career paths and creating many job opportunities but providing a significant boost to rural employment and the local economy. A boom in Wine Tourism: the increasing number of vineyards and wineries open to the public is creating a whole new growth area for tourism in the UK. “This is an immensely important component in the financial viability of many vineyard regions around the world,” added Simon Robinson. “The benefits here spread beyond the vineyards to the pubs, restaurants, hotels and retailers within those areas – thus boosting the rural economy.” Several regional vineyard trails are underway and WineGB is now actively engaged in discussions with central and local government and tourist boards about developing this important sector. Drawing on the experience of other established wine regions, by 2040 wine tourism in the UK could generate an additional revenue alone of £658m per annum. Flying the flag for Britain’s wines on the global market: “Exports will be especially valuable in the future,” reported Simon Robinson, adding that selling across the world also serves to promote tourism. Exports have doubled in the last 12 months and global distribution has expanded considerably in just 2 years – now exported to 40 different countries around the world from 27 in 2016, with Scandinavia and US leading the way as the primary markets. Within the next 20-30 years WineGB expects that exports may account for 30-40% of the total wine produced in Great Britain, yielding a potential value of some £350m per annum. This year the UK wine industry is set for further ambitious growth following its momentous year in 2018. “I do not think it would be unreasonable to say that 2018 will probably go down as the year when the industry came of age for our colleagues in the wine trade both here in the UK and overseas,” comments the WineGB Chairman. Some photographs of the Dinner at Vintners’ Hall can be available by 21:00 on Thursday 31 January. Posted in Trade Press Releases and tagged WineGB, Duchess of Cornwall, Vintners' Company, Wine Indsutry.